Fitness rookie? Experienced warrior? We love you just the same; which is why our personal trainers tailor your training just for you. When you think you can only do one more, they think you can do four. When an injury has you discouraged we’ve got your back. Our trainers’ expertise and encouragement will boost your workout and your mood. They use their knowledge to give you the most bang for your exercise time. Want results? Have some goals? You have the best in your court to help you find your best. One-on-one training keeps you focused and successful, but three or four is not a crowd. Ask us how getting friends sweating together is a win-win. Call today to get started! 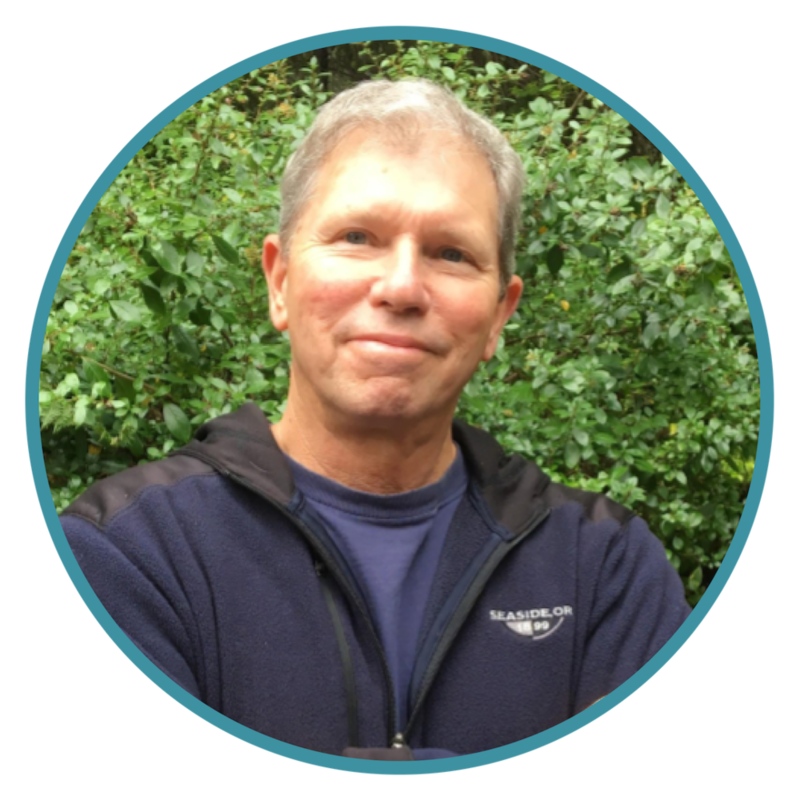 Jim has been a personal trainer for 30 years and has worked with a broad spectrum of individuals ranging from junior high school athletes to stroke recovery patients. His philosophy is to strengthen the whole body in a safe and systematic way to optimize results without exacerbating existing medical conditions. Jim is a graduate of Brigham Young University and received a Master of Science degree in Exercise Science giving him the tools necessary to provide effective exercise programs for all levels of fitness. Years of experience and study have further improved his training methods. Jim has loved serving both the young and old populations in the Florence area and looks forward to many years of working with the great people of the central Oregon coast. ACE Certified Personal Trainer, Strength Conditioning - ACE Certified, Senior Fitness - ACE Certified, and More! Prior to living in Florence, Joan owned a gym in Indiana. She is certified by the American Council on Exercise and has taken numerous education courses emphasizing successful methods for enhancing fitness performance. Joan enjoys helping her clients gain physical strength, balance and confidence by focusing on functional training techniques. Careful consideration of these factors can be the first line of defense in injury prevention. Joan strives to create exercise programs that consider core strength, joint flexibility, and muscle imbalances and is dedicated to helping her clients improve or maintain health and fitness. In his younger days he was a mountain and rock climbing guide, but for the past 13 years John has enjoyed working as a personal trainer for men and women with a wide variety of physical conditions. Being a baby boomer himself, John can relate to the aging process. Using his extensive knowledge John focuses on safety and enhancing the quality of life of each of his clients. Most of all he loves bringing a positive attitude to each session and a smile to every person. John's niche in the Personal Training world includes; the older population, strength and toning, post-rehab and small group training. Roby has been exercising for 40 years. In his younger years he was a competitive all-natural bodybuilder holding titles such as Mr. Universe, and Mr. California, as well as being featured in several fitness magazines. He completed his first Personal Training Certificate in 1995 with the International Sports Science Association and then worked with a physical therapist as an outpatient strength and conditioning instructor. For ten years, starting in 1997, he also managed a personal training studio while maintaining an in-home fitness business. As a senior himself, he enjoys working with other seniors that are new to the gym and want to get a fresh start in fitness and lead a healthier life. For the past 15 years he’s enjoyed helping people with functional fitness, strength conditioning and slowing down the aging process. He takes an individualized approach to each person’s fitness goals and recommendations from their healthcare professional. Rick joined the United States Marine Corps at the age of 20. In boot camp he learned the important concepts of self- discipline, physical conditioning, and teamwork. While in the Marines, a passion grew for both running and weight lifting, a combination of aerobics and resistance training. Rick enjoys developing and implementing fitness programs that are individualized, based on a person’s physical-activity levels, current health status, unique needs and desires. Rick has a passion to pass on knowledge to help others learn and grow. He is both excited and grateful to be a member of the staff/family here at Coastal Fitness and is looking forward to partnering up with one and all on this journey towards optimum health. Josh has an Associates Degree in Exercise and Movement Science and is working towards a science degree. He is an athlete right here from Florence. “I became a personal trainer because it is my passion to understand people and help them reach their fitness goals,” he expounds. “I love to be able to share my knowledge and experience with others.” Outside the gym Josh enjoys hiking, surfing, wake boarding, fishing, golfing and snowboarding. Josh's specialties in Personal Training include; athletes the older population, strength and toning, post-rehab, and small group training. Rachelle was raised in Florence from an early age. Active with sports throughout school and a love for the outdoors really gave her motivation to stay active and fit. She has four children and has developed a passion for fitness and nutrition over the last decade. Rachelle loves more than anything to help people set and achieve their goals while improving their minds and bodies in a healthy lifestyle. She specializes in resistance and Kettlebell training. Rachelle is certified in Personal Training and in addition is going to school for Fitness Nutrition. With team training, expert coaches and motivating teammates converge to create a contagious inspiring workout. Add passion, energy and functional exercise and you have the perfect mix to achieve your goals. Talk to a staff member to find out more!